Apple Music and other paid subscriptions are now the biggest source of revenue in a growing music industry, with only streaming and 75 percent of the money earned, much more than any other contributor. According to the 2018 Mid-Year Music Revenues Report, published this week by the Recording Industry Association of America (RIAA), the American music industry saw an increase in total revenues. That revenue rose to $ 4.6 billion in the first half of the year, up from $ 4.2 billion at the same time in 2017. Three-quarters of the industry's revenue in the first half of 2018 came from streaming, compared with 12 percent digital downloads and physical sales fell to 10 percent. Meanwhile, streaming revenues in the first six months of the year grew to $ 3.4 billion, a 28 percent jump from 2017. Of that revenue, according to RIAA, $ 2.55 billion came from paid subscriptions to Apple Music, Spotify, Tidal and others, although the association did not exclude the various services. The figure of $ 2.55 billion is an increase of $ 1.9 billion in the first half of 2017 and $ 1.1 billion in the first half of 2016. Apple Music has reportedly overtaken Spotify as the best music service for subscribing to streams in the US in July. 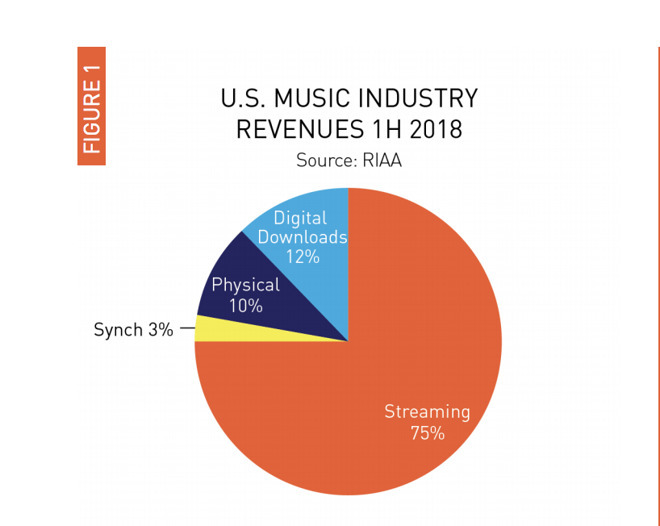 There are now 46.4 million paid music subscriptions in the United States, up from 31.5 million a year ago and 20.3 million two years ago, according to the RIAA. At the same time, US digital download revenue, as business models have shifted, dropped to $ 562 million in the first half of this year, from more than $ 1 billion two years ago. In the full year 2017, streaming contributed 65 percent of the industry's revenue, RIAA said earlier this year. In her new report RIAA acknowledged that even with the streaming success the sector faces challenges. "Finding an audience between an extraordinary range of music choices, competing for the user's attention to other entertainment options on the ubiquitous smartphone and being prominently present on dozens of different digital platforms is not only crucial to success, they are attributes that are unique within the contemporary record company, "said Mitch Glazier, president of RIAA, about the results.